One of the greatest mysteries of archaeology is the sudden rise of Egyptian civilization five thousand years ago. At this time the people of the Nile Valley moved from simple agricultural villages that barely changed from millennium to millennium, to the building of the pyramids, in a span of about two centuries. Historic Egypt began with an explosion of growth unmatched in recorded history, save our own era. It is reasonable, then, to wonder if we have all the information, if perhaps below the deep silt of the Nile Delta or the shifting sands of the Western Desert are the remains of a lost advanced culture, perhaps a missing link to Atlantis. 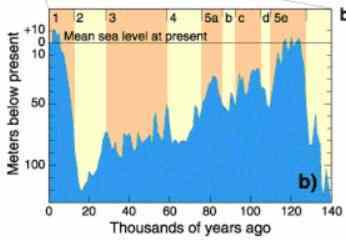 Modern scientists have found a 300 foot rise in sea level has occurred over the last 18,000 years, as the glaciers from the most recent Ice Age melted. The assumption is that this melting was gradual as the climate warmed. However, some researchers believe a series of comet fragments crashed into the frozen northern hemisphere at this time with enormous heat, causing a tidal wave of meltwater that submerged coastal areas very much as the story has come down to us. A massive Solar storm has also been suggested as the cause of glacial melt and sudden sea level rise. One effect would be that really old archaeological sites from a sea-faring nation, as Atlantis was supposed to be, would now be deep underwater. 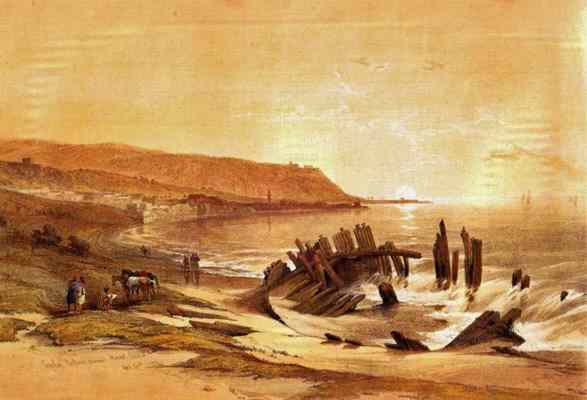 The Ancient Greek philosopher Plato told a tale of a highly evolved culture on a large island in the Atlantic Ocean, that was destroyed or sank about 12,000 years ago. Plato said the story was passed down from Solon, a historical person who learned it during a ten year stay in Egypt. "There have been, and there will be again, many destructions of mankind arising out of many causes." What the priests told Solon was not comforting. The Egyptian priests recounted the Greek story of "Phaethon, the son of Helios, having yoked the steeds in his father's chariot, because he was not able to drive them in the path of his father, burnt up all that was upon the earth"
"Now, this has the form of a myth, but really signifies a declination of the bodies moving around the earth and in the heavens, and a great conflagration of things upon the earth recurring at long intervals of time: when this happens, those who live upon the mountains and in dry and lofty places are more liable to destruction than those who dwell by rivers or on the sea-shore; and from this calamity the Nile, who is our never-failing savior, saves and delivers us." "When, on the other hand, the gods purge the earth with a deluge of water, herdsmen and shepherds on the mountains are the survivors, whereas those of you who live in cities are carried by the rivers into the sea. 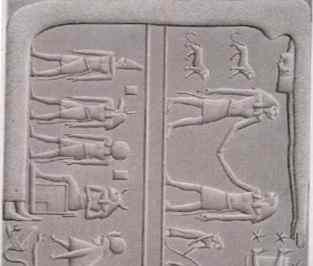 But in Egypt neither at that time nor at any other does the water come from above on the fields, having always a tendency to come up from below, for which reason the things preserved here are said to be the oldest." "If any action which is noble or great, or in any other way remarkable has taken place, all that has been written down of old, and is preserved in our temples"
"In those days the Atlantic was navigable; and there was an island situated in front of the straits which you call the Columns of Heracles (the Strait of Gibraltar, known as the Pillars of Hercules): the island was larger than Libya and Asia (Turkey) put together." "In the island of Atlantis there was a great and wonderful empire, which had rule over the whole island and several others. Besides these, they subjected the parts of Libya within the Columns of Heracles as far as Egypt, and of Europe as far as Tyrrhenia (Italy)." 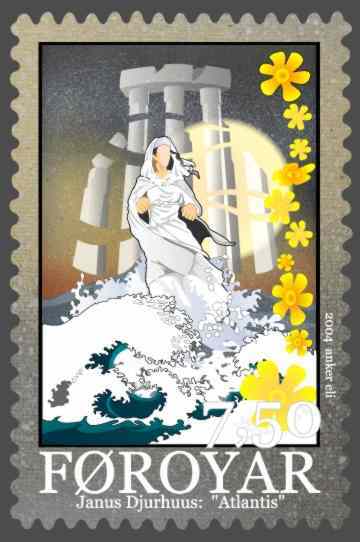 The postage stamp featuring Atlantis (above right) is from the Faroe Islands. Engraving by David Roberts, 1839. A recently discovered temple group in south central Turkey has opened another front in the Atlantis debate. This 9000+ year old site, twice as old as the Pyramids, contains hundreds of finely carved stone pillars weighing several tons each. The ancient people of Gobekli Tepe were able to organize and concentrate their labor on a level completely unexpected by archaeology for a stone age culture. Gobekli Tepe. water access to the entire city. Edgar Cayce, an American psychic who lived from 1877 to 1945, gave thousands of readings concerning people's previous lives and the effects those lives were having on the present. Frequently those lives were in Atlantis and a cohesive picture emerged of this now forgotten part of Human history. The story he gives is fantastic but it fits very well with what has already been presented here. Edgar Cayce puts the origin of the human race at about 10 million years ago. At this time souls were drawn to material existence and were enveloped by it, forgetting their true (free) nature. Technological development took place rapidly in a land mass in the North Atlantic Ocean, until a time when great power was concentrated to rid the land of large and dangerous animals that were considered a peril to man's continued existence. The results of this connecting of Solar and Earth energies about 50,000 years ago were enormous volcanic eruptions and earthquakes, destroying much of the continent and setting back the clock of civilization. Far from being a paradise, Atlantis was deeply divided into two groups, known in the Cayce readings as the Sons of the Law of One (the good guys) and the Sons of Belial (people stuck in selfish materialism). A further complication was the use of slaves, considered "things" by some and worthy humans deserving of every care by the others. It is probable that there were great differences in the cultures of the three periods of Atlantian history, and probably each populace believed themselves superior to the last and was certain that they would not make the mistakes the others had. But there was a third rise and a third fall, this last civilization ending about 12 thousand years ago. It was this catastrophe that was reported by Plato and Moses and, this time, there was nothing left to rebuild. This chronology from Edgar Cayce fits fairly well with the Egyptian's own stories of Zep Tepi, the times of the Gods (Atlantis), and Companions of Horus (unknown pre-historic civilization on the Delta). The time given for Atlantis also coincides with the time Cro-Magnon Man supplanted Neanderthal in Europe and Asia, Homo Sapiens with a larger brain than we have today. Cayce places the building of the Pyramid and Sphinx in the first (now lost) Egyptian civilization, beginning 12,000 years ago. Geologist Robert Schoch's analysis of the weathering of the Sphinx and Sphinx Temple gives a minimum of 7000 years old, so the two align fairly well. The Pyramid referred to, perhaps, may be seen in the large (200 ton) stones at the base of Chephren's Pyramid and scattered around the plateau, allowing the currently standing pyramids to be the work (mostly) of historical Egypt, as the archeologists insist. 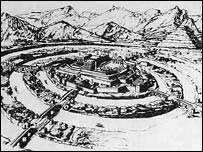 "A record of Atlantis from the beginning of those periods when the spirit took form, or began the encasements in that land; and the developments of the peoples throughout their sojourn; together with the record of the first destruction, and the changes that took place in the land ..... that are as copies from the sunken Atlantis. For with the change it must rise again. from "la Description de l'Egypte". Robert Lawlor, in his book "Voices of the First Day" describes Australian Aborigine culture as a dynamic civilization with a continuous oral history spanning forty thousand years. There was communally agreed law, trade and cultural exchange over the entire Australian continent and by sea, and highly developed art and song. When the English arrived they saw none of that. Perhaps we define civilization too much in our image, perhaps there were global cultures that have risen and fallen as so many sources say, cultures of mental technology instead of physical ... perhaps what we suppose was their religion could better be termed their physics. Linguists agree that sometime around 80,000 years ago all the humans in the world began speaking in words. The scientists don't know where it developed, because language spread so quickly - the same language. Every language today is descended from that single language of 80,000 years ago. No exceptions. Is that an indicator that there was something like a global culture at that time? The time of Modern Humans. Chart from the U.S. National Oceanic and Atmospheric Admin. Atlantis sent out ships to the far corners of the world. and the other so-called Gods of our legends.